The hulking yet dainty entity known as Grunts for the Arts, made up of a multitude of interdisciplinary artists, came together, operating with a collective hive intellect, in direct response to the manner in which grassroots activity is too often overshadowed by large-scale commercial projects and enterprise. Always ready, whenever the call may come, their every action was guided by a passionate and heartfelt certitude in the value of holding up artistic and political phenomena to the inquisitiveness of the artistic mind, creating artworks and hybrid events both novel and accessible, inspirational and jollifying. A dream lingered, wisplike, as the backdrop to all they did; a dream of a world populated by hybrid forms of art, where individuals and groups are thrust onto an unfamiliar common ground in which heightened experiences of artistry thrive. As you are probably/hopefully but may not be aware, in April 2007 we slip-slided out the womb of artistic creation and became a sleek vehicle for artists to (hyper) ventilate their concerns regarding the decimation of the Arts Council’s Grants for the Arts scheme. Our philosophy then was that if money was going to be diverted from the arts to fund the London Olympics in 2012 then it was our responsibility – nay, our God-given imperative – to retrain artists as sports people. Which we did, in truly magnificent fashion. And all was good. In the 2007’s Comprehensive Spending Review (October 2007), it was even decided to give the Department of Culture, Media and Sport an inflation level increase in their funding allocation. But such happy states rarely last. And such was the case here. Soon our attention was drawn to the rapidly degenerating Olympic Dream which, whilst in part revived by the success of the horrendously named Team GB in Beijing, was first resuscitated – we like to believe – by our London 2008 intervention. But even when at leisure, the circle of life continues to spin, and the moral pendulum continues to swing. For every wrong we’ve righted, another right has become a wrong, and so – in effect because we’ve been so darn good in the past – we’ve been landed with the Big Society, the Con Dem coalition, the destruction of our public services, the decimation of our education system, and the slightly unfair joys of bankers and the tax exiled. Perhaps you’re concerned about what the future may hold, we know we were. But we planned and we plotted, we schemed and we scammed – and back we came with a brand new vision. We found 20 billion down the back of the sofa, and reallocated it in The Real Trident Replacement Challenge! And then came London 2012. In so many ways the event for which we were born, it was inevitable that something special would happen when two such might forces as the LOCOG marketing machine and the Grunts for the Arts dream should meet. And so it was the case – we annulled the Olympics with our very own Closing Ceremony, helped the Olympic marketing machine with our O BOLLOX sticker set, and distributed hundreds of letters calling for Jeremy Hunt to resign. And thus we fulfilled our fate. Just as we like to imagine a perfect romance that ends with no acronyminity, just two people deciding that there time together lies in the past, so do we now feel that the time for Grunts for the Arts has been and gone. 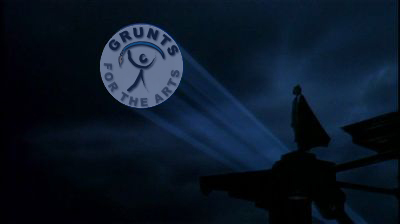 GRUNTS FOR THE ARTS IS DEAD! LONG LIVE…. I hope every one gets their arty farty arses down to the marshes on Saturday. This is going to be a great event for keeping our spirits high. Keep up the good work grunters. We really must do everything we can to keep this issue in the public eye. Let’s enjoy those games! Go gobble those Olympic Rings! Save Art! Save the world! Tremendous! Out in the sticks it’s going to be worse grant wise. Government says they’re for young people. Huh! Where’s the money save Lottery sporties. More problems created for young people, I reckon. One asset we do have as artists is imagination and the ability to tackle issues creatively (as seen – excellent project!). Can we do this en mass to have an even greater visual/physical impact when the games are actually happening? Please Keep me informed of events you are planning. I will be doing a few little things myself in the run up to the games…Dont Fence Me In..thats my slogan!